You need a govt jobs you have great opportunity to work with this Nation Buildings Construction Corporation . candidates in India for Deputy project Manager Junior Engineer jobs. 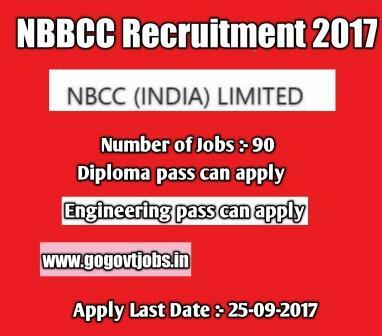 So you want work with this NBCC (INDIA ) Limited now you can apply till 25-September-2017. NBCC Released total number 90 jobs. Educational Criteria :- Only those candidates are eligible who have passed Full Time Degree in Civil /Electrical Engineering or equivalent from Govt recognized University with minimum 60% aggregate marks. Diploma in Civil or Electrical can apply this NBCC (INDIA) Limited. Age Limits :- Candidates age Limits should to be possess minimum age 18 years & maximum 33 years.